Q] Welcome to Fantasy Book Critic. To start with, could you tell us what inspired you to be a writer in the first place, what experience you went through in finding a publisher, how you ended up with Hodder & Stoughton, and anything else you’d like to share about yourself? GW: I’ve been making up stories for as long as I can remember. Even before I could write, I would draw cartoons and get my mother to write in the speech bubbles. So, I’ve sort of always wanted to be a writer. I found a publisher in the time-honoured way of first sending the manuscript out to agents. Once an agent decided to represent me, she sent the script out to publishers. It was a slow process, with many ups and downs, but in the end Hodder & Stoughton said they were interested. Q] In your biography, its mention that you were born and brought up in South Africa and traveled a lot to places such as New Zealand, United Kingdom and India. It’s safe to say you were probably exposed to a lot of different cultures and mythology. How much of this helped shape the world of your books? GW: All the things you mention have certainly influenced my writing. For me, writing is a bit like dreaming. Things bubble away in your subconscious and then, hopefully, emerge as something interesting. So, I think all my experiences of growing up and travelling to different countries have sort of stewed in my head and then come out as Land of Hope and Glory. In the case of India, I backpacked around parts of the country when I was 22. It was my first trip on my own and the whole experience made a huge impression on me. The place just seemed to capture my imagination. Q] So for someone who hasn't read any of your novels, how would you describe the type of stories that you write, what would be your pitch for the Land of Hope and Glory Series? "It is 1852. The Indian empire of Rajthana has ruled Europe for more than a hundred years. With their vast armies, steam-and-sorcery technology and mastery of the mysterious power of sattva, the Rajthanans appear invincible. But a bloody rebellion has broken out in a remote corner of the empire, in a poor and backward region known as England . . ."
Q] Speaking of the series, how many volumes do you think will be required for this saga? How far along are you in the next book, and is there anything you can tell us about books two, three and the series beyond? GW: This particular saga will consist of three books. There is an overall story arc that will conclude at the end of the third book, and many of the things that are mysterious in the first book will be explained by the end of the trilogy. That is as far as the plan goes at the moment. However, there is scope for there to be further stories set in the same world, potentially with the same characters. I’ve finished the second book, which will come out in hardback later this year, and I’m busy working on the third book at the moment. Q] In your series, the reigning superpower in the world is the Rajthanan Empire, What were your reasons for focusing on this region of India and making it a global superpower? GW: Surprising as it may seem, I’ve never considered this question before. Firstly, to be clear, the heartland of the nation of Rajthana is the region now known as Rajasthan in our timeline. The reason for focusing on India at all is obviously that the story is a reversal of Britain’s colonization of India. But why did I choose this particular part of India to be the superpower? I wish I could give you a clear answer, but the truth is that the decision was as much instinctive as rational. It just felt right. When I was first developing the ideas for the series I was reading quite a lot about Indian history. When I considered the history of Rajasthan, everything seemed to fit perfectly. But I do want to add, I could have chosen another region. I don’t want to seem as though I’m suggesting no other part of India could have turned into a superpower! Q] Both your books have striking covers with a specific theme and style. 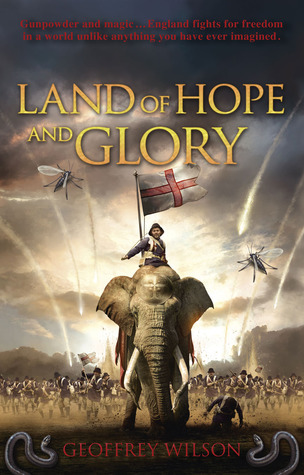 What do you think of the covers for “Land of Hope and Glory” and “The Place of Dead Kings”? Did you get to provide any input? And what are your thoughts on cover art in general? GW: I think both covers look great – very cinematic. With the first book, Hodder & Stoughton already knew what they wanted for the cover. But when it came to the second book, they asked for my suggestions. In both cases, they wanted to know details about the uniforms, weapons and so on. I wrote a brief guidebook for the artist to use. What amazed me was that my guidelines were followed so carefully. I was stunned when I saw both covers because they looked so much like the way I’d imagined things. 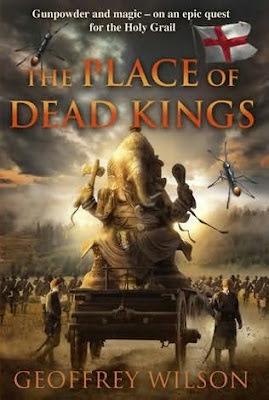 Q] In regards to cover art, on the cover of your second book "The Place Of Dead Kings", which follows the same style and pattern with its predecessor, I noticed a striking Ganesha statue. Could you tell us about its presence and if it has any tie-ins with the book’ plot? GW: The image is very striking, isn’t it? I’m afraid I can’t give away too much of the plot yet, but I can say that the statue plays a significant role in the story. Q] Could you explain about how the genesis of the Land of Hope and Glory series occurred? How long have you been working on it, and what drew you to the subject matter of the series? GW: I had a few vague ideas floating around in my head. I wanted to write something that combined 19th century warfare with magic. I also wanted to write something with an Indian theme. I was reading about the 1857 uprising in India and somehow all the ideas just crystallised in my mind into Land of Hope and Glory. GW: The main challenge with the second novel was that I had to write it a lot faster than the first. I wrote the first book, off and on, over the course of four years. I had to write the second in a year to fit in with my publisher’s schedule. That was a bit of a shock. But otherwise, I followed the same general approach for both books. I started writing the first book in 2006, so I’ve been working on this series for six years now. Q] Most writers have a muse and some don't, what has been the case for you? Also what is your daily writing schedule like? Do you have any specific routines like a certain Dan Brown who uses gravity boots? GW: No, I don’t have a muse. At the moment I’m lucky enough to be able to write full-time. In theory I try to keep ordinary office hours, but in practice I’m a slow writer, so to get things finished on time I often work late and at weekends. My friends and family have been very understanding about this. I didn’t know about Dan Brown’s gravity boots! But, no, I don’t have any special routines. The only rule I’ve introduced is unplugging the computer from the internet. It’s so easy to waste time on the internet. Q] Will you be exploring other lands besides England in your books and will the readers get to see the Indian subcontinent wherein Sattva was first discovered? Similarly will we get to learn more on the relationship between Sattva, its human users and the overall world? GW: In the first three books, the emphasis is on Britain. But I would like to explore the rest of Europe and it would be great to set some stories in Rajthana itself. I have quite a few ideas, but at the moment I’m focusing on finishing these three initial books. However, more is revealed about sattva in the second book and there will be much more in the third book. Also, Rajthanan characters play a greater role in books two and three, and so, through them, we find out a little more about Rajthana. Q] Nowadays with many series having such diverse genre labels such as Bug-punk, Ice-Punk, Bio-punk etc. What do you feel about your series being labeled as “Sattva-Punk”? GW: When I saw you’d coined the term “sattva-punk” in your review I thought it was a stroke of genius. It’s a perfect label for the series. Perhaps some other writers will try writing sattva-punk now too. Q] After finishing your series, whenever that might be, what do you hope to write next? Do you see yourself trying out different genres? Different formats? 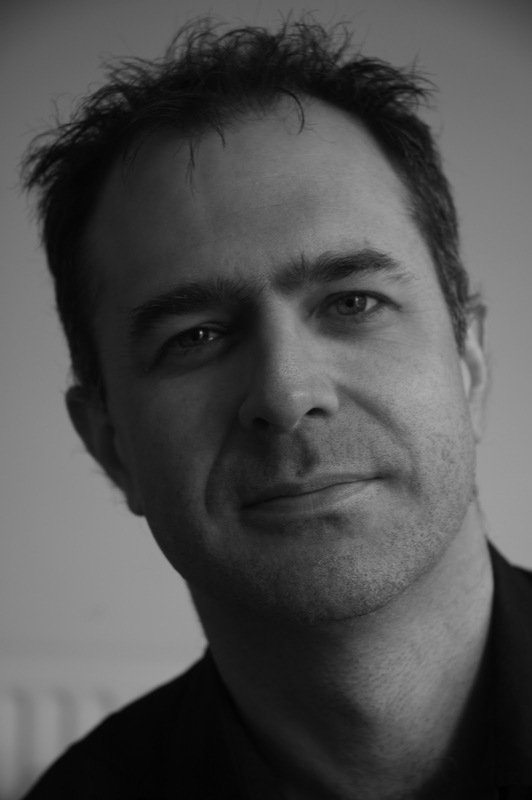 GW: At the moment I’m busy working on book three and I find it hard to consider anything much beyond that. The future is hazy, but whatever I’m doing, I’m sure I’ll always be writing stories of some sort. Q] In alternate history, often a map or timeline makes the narrative easier to follow for the reader; will we get to see either or both in the next book/s? GW: Many people have requested maps and a timeline and I will provide them. Unfortunately, it won’t be possible to include anything with book two, as that has already gone to the printers. However, I will start putting this information up on my website as soon as I can find the time. I promise! GW: I ended up doing a lot more research than I expected, mostly because I found out I knew very little about the topics I’d chosen to write about. I came across all kinds of fascinating things along the way, too many to mention here. But one thing that springs to mind is the fact that gunpowder and firearms might have been invented in India. Certain ancient Indian manuscripts describe weapons, called ‘nalikas’, that appear to be cannon and muskets. These manuscripts also contain recipes for gunpowder. All of this apparently predates the use of firearms anywhere else in the world. Historians disagree about this, so we can’t say for certain that firearms were invented in India. But I found this suggestion intriguing and so, accordingly, I decided the Rajthanans in my book would call muskets ‘nalikas’. Q] Who are the people who can lay claim to being your literary idols and which books are your favorites amongst the many genres that you read in? GW: The books that have influenced my writing the most are, perhaps predictably, The Lord of the Rings and the Gormenghast series by Mervyn Peake. I read these when I was fairly young and they had a big impact on me. In many ways all my writing is an attempt to recreate the magic of reading these books for the first time. Q] In closing, do you have any last thoughts or comments you’d like to share? GW: The only thing I’d like to say is thank you so much for taking the time to review my book and interview me. It’s not easy to promote a book and appearing on Fantasy Book Critic will be a big help.